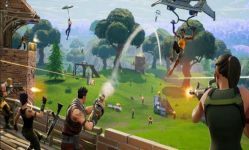 Battle Royale In this free mode up to 100 players compete either alone, in pairs or as a small team of up to four against each other. The last survivor, or the last surviving team, wins. At the beginning of a round, all players jump over the same map and are equipped with only one pickaxe, with which they can mine the building materials wood, stone and metal. The materials collected in this way can be used to build walls, stairs and other forms that protect against enemies and their shots, or can be used to avoid obstacles. Weapons and other useful items are distributed on the card and can be picked up by the player. Rarer items are in boxes, supplies, piñataTo find -lamas and vending machines. Crates are mainly found in buildings. Stock deliveries appear randomly and have a greater chance of containing better weapons and items. Llamas are very similar to boxes, but they take longer to open, and they contain better weapons / items.